The city that never sleeps may no longer be smoker-friendly, but the Sherman family’s new tobacco shop on 42nd Street turns the clock back with three stories of nostalgia and retailing magic that’s a theatrical oasis for smoking enthusiasts. A little over two years ago, the Sherman family never would have guessed that it would soon be considering the pros and cons of moving the company’s Manhattan retail store from its location of 16 years. A neighborhood fixture, the two-level shop had a commanding, successful presence at the corner of Fifth Avenue and 42nd Street, just across the street from the New York City Public Library. The company’s long-term lease in the 60-story building had expired, but the Shermans had the option to renew and remain firmly in place. But at the same time, a recent change in the building’s ownership also prompted the Shermans to pause and ponder the question: If - for the sake of argument - they were to move the retail store, where would the best place to make its new home be? In a stroke of good fortune and timing, a unique opportunity soon presented itself - the availability of an entire three-story building, literally across the intersection and a few paces to the east of the store’s location at the time. A change of neighborhood and potential loss of regular customers could be avoided entirely. “It had so many benefits to it - the fact that it was freestanding, the layout, and all the things we could do to it,” says Joel Sherman, president and c.e.o. of the company and son of the late company founder, Nat Sherman. Envisioning its potential wasn’t exactly a task for the timid: the place was nothing short of a wreck, and the entire structure would ultimately need to be reengineered, top to bottom. Excited at the prospect of being able to design an entirely new incarnation of the store from top to bottom, the family embarked on an unexpected new chapter in the store’s history - and the most complicated one to date. Finding a new home for the company’s retail store isn’t an entirely foreign concept for Nat Sherman: the new store which opened at 14 East 42nd Street with a grand-opening celebration in November 2007 marks the fourth location during its 78-year history. Each site change has reflected various stages in the company’s evolution and vision as a retailer, wholesaler, and even manufacturer. 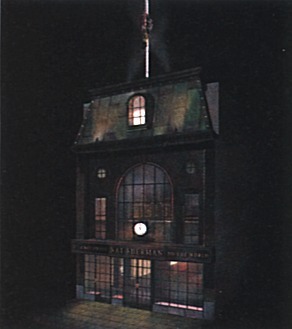 Nat Sherman’s first store opened at 1400 Broadway in the heart of New York City’s garment center in the early 1930s. Within a few short years, it became a high-profile hangout for fashion and show business executives, as well as gangsters - all big fans of premium cigars. In the 1970s, the tobacco store joined the prestige retailers along Fifth Avenue at 55th Street, close to the Plaza Hotel and Park Avenue South, but by the late 1980s the shop had veered from its roots, selling more gifts than tobacco products. But the biggest transformation occurred in 1990 when Joel rejoined the company after Nat’s passing, and in 1991 - anticipating a resurgence in premium cigars - opened the former Fifth Avenue and 42nd Street shop. A stylish and ornately-appointed destination for cigar enthusiasts, it represented an entirely new phase of the retail store and helped raise the bar throughout the industry for a new generation of high-end, customer service-oriented shops. Joel’s instinct and passionate belief that a premium cigar renaissance was just around the corner was proven correct. For this newest retail store, the Shermans enlisted the expertise of architect Jack A. Michaelson of Design Consortium to direct construction and to style the building’s three-story, old-world facade, which is reminiscent of architectural styles found in Edwardian London. Inside, noted set designer Charles McCarry, who has worked on top Hollywood movie and TV projects as well as Broadway productions, was again tapped to create the store’s environment (he also designed the interior of the former story). The main sales area is modeled after Henry Higgins’ library in My Fair Lady with a soaring 30-foot ceiling and perimeter balcony filled with cigar boxes stacked like books. 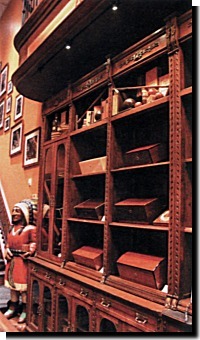 In fact, some of the soaring antique shelves in the main atrium area of the store came from an old tobacco store in England, purchased at an auction back in 1998 and awaiting the right opportunity to put them to use. “We had no real purpose for them at the time,” says Larry. “We thought maybe if we opened up another store one day, we’d use them. They didn’t really fit in the environment of the old store.” Most were stored at the company’s manufacturing and warehouse facility in Greensboro, N.C. “With this space, it was perfect,” he says. While Joel led the design of the last store 17 years ago, this time around he left most of the decision making to Larry, Bill, and Michelle. About sixth months were spent in the design stage, meeting twice a week with the architect and set designer, “We set out to create the environment, the experience,” says Larry. Nostalgic decorations drawn from the company’s 78-year history are displayed throughout the store, including many vintage Nat Sherman advertisements and family photos, joined by special items liked framed American flags sent from soldiers in Iraq in appreciation of the Sherman family’s donation of cigars for troops. 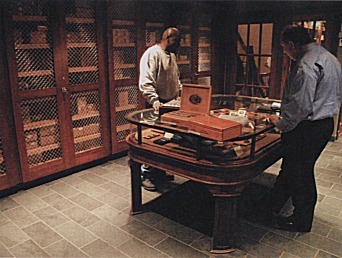 At the rear of the walk-in humidor on the lower level - which houses boxed cigars behind locked “cage” doors - is an area dedicated to limited supply cigars called The Blender’s Vault. It features cigars that aren’t distributed are sold anywhere else - new blends that are being tested or older blends that are discontinued. Limited in supply and unique, special, when they’re gone, they’re gone. For the first time, the store’s entire facade became a blank canvas, an important marketing consideration for the company which is also a manufacturer and national distributor of luxury cigarettes, premium cigars, and pipe tobaccos. “The retail store has always been the flagship for the brand,” says Larry. In standard lease arrangements, tenants must generally conform with the existing facade where “it’s kind of hard to showcase your identity,” says Larry. 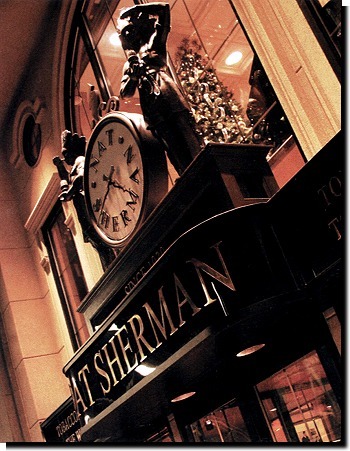 “Being able to create our own storefront and image that would help enhance the brand was a big part of the decision to move.” The iconic Nat Sherman clock which adorned the corner of the previous store and became the company’s corporate logo, is prominently featured on the new building’s facade. To call the project a renovation is a big understatement. The Shermans are quick to point out the massive scope of construction that took place. “It was basically three walls and a floor,” says Larry of the building before renovation began. “What we basically had was an old shell,” confirms Joel. Among the infrastructure improvements were the installation of a new steel beam roof to support a massive array of HVAC equipment; all new electrical wiring and plumbing; an 800-amp electrical board; new stairs; and even a three-story elevator. 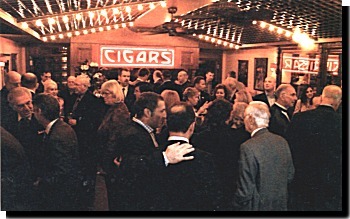 To meet the specialized air handling requirements of a cigar shop in which some areas are partially humidified and others fully humidified, combined with the Sherman’s desire to circulate plenty of fresh air to prevent a buildup of smoke, an extremely sophisticated heating ventilation air conditioning (HVAC) system was installed. “[The engineers] said that we have enough HVAC equipment on the roof of this building to cool and heat a 23-story building…under normal circumstances,” says Larry. The club will be run by Richard Egan, manager of the former Luncheon Club at the New York Stock Exchange, and will feature a full liquor license and small appetizer menu representing a collaboration of some of New York’s most famous institutions, such as smoked fish from Russ & Daughters, Murray’s Cheese, and Frank Sinatra mainstay Patsy’s Italian Restaurant.